A Gentile is a non-Jew, the term being a common English translation of the Hebrew words goy (גוי) and nochri (נכרי). The word "Gentile" originated as an anglicized version of the Latin gentilis, meaning belonging to a certain clan or tribe. The Hebrew plural word goyim is sometimes translated as "the nations." The term has also been used by Christians to signify non-Christians who are not Jews, a rough equivalent of the word "infidel." 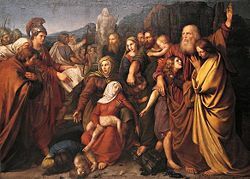 In ancient biblical times, the Israelites were strictly warned to keep separate from the Gentiles upon entering Canaan, but the Mosaic Law also provided protection for Gentiles who settled among the Jews. The Book of Leviticus thus commands: "The stranger that dwelleth with you shall be unto you as one born among you, and thou shalt love him as thyself" (Lev. 19:34). After the Babylonian exile, debates arose among the Jews regarding how Gentiles should be treated. In New Testament times, these debates found their way into the emerging Christian tradition, which had to decide whether Gentiles were allowed to join the movement, and under what terms. Later, the persecution of Jews by Christians in medieval Europe led to harsh proscriptions against Gentiles in the Talmud, which gradually softened over the centuries through various rabbinical rulings. 3.1 Who is my neighbor? Today, Jews generally believe that Gentiles must be treated with mutual respect, especially if they adhere to the so-called Noahide laws, considered binding on all humankind, while Jews must obey the entire Mosaic Law. 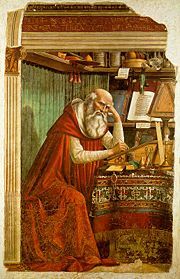 Saint Jerome used the Latin term gentilis, from which the English "Gentile" is derived. In the Hebrew Bible, the terms goy and goyim were sometimes applied both to Israelites and to non-Israelites (Gen. 12:2, Ex. 33:10; Deut. 4:7 and so on). However, they are employed in many other passages to designate nations that are politically distinct from Israel (Deut. 15:6, Josh. 23:4, and so on). From this use is derived the meaning "stranger" (Deut. 29:24). Since the non-Israelites were worshipers of other gods, goy came to denote a "heathen." The Latin term gentilis relates to gens, from which also derive gene and genus, meaning descended from a common ancestor. The original meaning of "family," "clan," or "tribe" was extended in later Latin usage to the wider meaning of belonging to a distinct nation or ethnicity. Later still, the word came to mean "foreign," that is, non-Roman. After the Christianization of the empire, it could also be used of "pagan" or "barbarian" cultures. In Saint Jerome's Latin version of the Bible, the Vulgate, gentilis was used in this wider sense to translate both Greek and Hebrew words that referred to the non-Israelite peoples. These twelve Jesus sent forth, and commanded them, saying, "Go not into the way of the Gentiles, and into any city of the Samaritans enter ye not: But go rather to the lost sheep of the house of Israel." Altogether, the word Gentile(s) is used 123 times in the King James Version of the Bible. The ancient biblical writers displayed a passionate intolerance toward the immorality connected with the goyim. The Canaanite tribes in particular constituted a constant temptation for the Israelites to engage in forbidden idolatrous practices. Because of this, the seven "goyim"—that is, the Gentile nations of Canaan (Deut. 7:1)—were to be treated with little mercy. More especially, marriages with them were not to be tolerated (Deut. 7:3, Ex. 34:16). Nevertheless, some biblical books do mention marriages with non-Hebrews (Ruth 1:4, 2 Sam. 3:3, Judges 3:6, 2 Sam. 11:3, I Kings 11: 1). This shows that in practice, intermarriage was not uncommon. Ruth: Although she was a Moabitess, Ruth was one of the most praised biblical women. Despite this hostility to foreign influence, the "stranger," whether merely a visitor or a foreign resident, received protection under the Law. The native-born Israelite was enjoined to love him (Lev. 19:34): "The stranger that dwelleth with you shall be unto you as one born among you, and thou shalt love him as thyself." Recourse to the courts was open to him (Ex. 22:21, Deut. 24:17), and "one law and one statute" was to apply to native and stranger alike (Lev. 24:22, Num. 9:14, Ex. 12:49). However, the stranger was expected to refrain from the worship of idols (Lev. 20:2, Ezek. 14:7), eating blood (Lev. 17:10) (these injunctions were also adopted by the earlier Christians, as indicated in Acts 15:20), working on the Sabbath (Ex. 20:10), and eating leavened bread on Passover (Ex. 12:19). In practice, however, the kings of Judah provided altars for resident foreigners to venerate non-Israelite deities, a fact much criticized by the prophets and authors of the Deuteronomic history. In some cases, Gentiles figure as exemplars of fidelity (Abraham's servant Eliezer), devotion (Ruth), piety (Job), and worship of Yahweh (Jethro). The Book of Isaiah's welcome and promise to the "sons of the stranger" (Isa. 56:3-6) displays the polar opposite of the spirit of exclusiveness often thought to be characteristic of Judaism. In the post-exilic period, on the other hand, Ezra and Nehemiah imposed rigorous measures to insure the purity of the seed of Abraham (Neh. 9:2, Ezra 9:2, and so on), namely the requirement of Jewish men to divorce their Gentile wives. 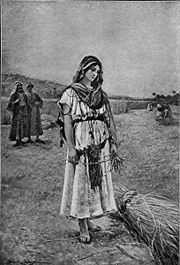 However, this attitude was not universally received and is balanced in the Bible by the teachings of the Book of Ruth, which shows that a Gentile woman was the great-grandmother of none other than King David, and the Book of Jonah, which shows God's compassionate providence for the great Gentile city of Nineveh. In pre-exilic times, commerce between Israelites and Gentiles did take place, but was generally disapproved of by the biblical writers and prophets. Non-Israelites such as the Egyptians, Philistines, Assyrians, Babylonians often appeared as enemies, while the Phoenician cities of Tyre and Sidon were important trading partners. However, Gentile mercenaries often appeared in Israelite armies and there was certainly a good deal of trade and diplomatic activity with non-Israelite peoples during times of peace. Moreover, Gentiles continued to live among the Israelites in both Israel and Judah, and the cultural influence of Gentile traditions was a constant sore point in prophetic and priestly writings. The Babylonian exile brought "Israel" into even closer contact with "non-Israel" in a situation where Gentiles formed the majority population. The establishment of the Second Temple resulted in a religious policy of strict separation under Ezra and Nehemiah. The rise of Alexander the Great brought Judaism of the Second Temple era into direct confrontation with Greek culture as a sometimes antagonistic force. The Maccabean revolution represented a bitter struggle against militant Hellenism. Occasional persecution under various Roman administrations intensified the antagonism of many Jews toward the Gentiles. For example, the Essenes, especially in the War Scroll, saw the Romans as enemy kittim against whom the Sons of Light would fight in the Last Day. The Zealots, too, adopted a militant attitude toward Gentiles. Despite these tensions, throughout the Second Temple period, many Jews freely interacted with Gentiles and adopted Hellenic customs. In New Testament times, a lively and sometimes heated debate over relations with Gentiles was conducted between the disciples of the Pharisaic sages Hillel and Shammai, the former taking a more liberal view toward commerce with non-Jews and the later taking the stricter attitude. The Jewish teacher Jesus of Nazareth seems to have sided with Hillel for the most part in this debate. (Jesus' commandment in Matthew's Gospel (10:5) against his disciples communicating with Samaritans may contradict this.) Jesus' dialog with an "expert in the Law" in Luke 10 typifies this internal Jewish argument. Here, Jesus and the halakhic expert agree that "Love the Lord your God with all your heart" and "Love your neighbor as yourself" are the two most important commandments in the Torah. The crucial question followed: "Who is my neighbor?" Does the term include only one's fellow Jew, or also Gentiles and the mixed-blood Samaritans? The early Christian movement—still at this time basically a Jewish sect—would soon face a major crisis over the question of relations with Gentiles, when Paul of Tarsus insisted that Gentiles be admitted to full membership without first converting to Judaism. Soon, Judaism and Christianity would part ways altogether. Meanwhile, increasing Roman persecution resulted in the ascendancy the Zealot party and those rabbinical authorities who took a hard line against commerce with Gentiles. Soon, Jewish revolts under the emperors Titus and Hadrian brought about tragic consequence for the Jews and intensified the sense of antagonism between Jews and Gentiles. In judging the later halakhic laws concerning Gentiles, it is important to consider this new, desperate situation of the Jews. No longer in possession of a land of their own and living among people who at times treated them as pariahs, the Jews were engaged in a life-and-death struggle for self-preservation. Thus, the rabbis of the Mishnah, though not uniformly antagonistic toward Gentiles, generally emphasized the need for separation and sometimes showed outright disdain for non-Jews. As with many Talmudic subjects, their opinions on the matter were far from unanimous. According to Rabbi Eleazar ben Azariah (second century CE) the maxim "Love and benevolence exalteth a nation" refers to Israel, while whatever charity the Gentiles practice is actually motivated by self-glorification. Several other tannaim (early rabbinical sages) agreed. But Rabbi Neḥunya ben ha-Ḳana interpreted the same maxim as follows: "'Righteousness exalteth a nation,' for benevolence, both for Israel and for the Gentiles, is a sin-offering." Gamaliel II is reported to have repealed an obnoxious law allowing Jews to use property stolen from Gentiles. Eliezer ben Hyrcanus, however, held that the mind of every non-Jew is always intent upon idolatry (Giṭ. 45b) and that Gentiles have no share in the life to come (Sanh. 105a). On the contrary, Joshua ben Hananiah contended that there are indeed righteous men among the Gentiles, and that these will enter the world to come (Tosef., Sanh. 13:2). Akiva, like Hillel, declared the command to love one's neighbor as oneself (Lev. 19:18) to be the fundamental proposition of religion (Yer. Ned. 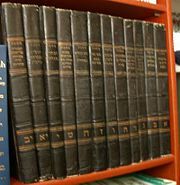 41c; Gen. R. 24). And once again, the question revolved around defining who is one's neighbor. Akiva himself was a strong Jewish nationalist who supported the Bar Kochba revolt against Rome in the mid second century. Among Akiva's disciples, Tarphon is noted for his antipathy to the Jewish Christians, whose books he would burn without regard for the name of God occurring within them (Shab. 116a). On the other hand Rabbi Meir showed a particularly inclusive attitude when he insisted that a non-Jew versed in the Torah equals in rank to the high priest (Sanh. 59a, Sifra 86b). He was also an intimate acquaintance with the Gentile philosopher Euonymos of Gadara. Simon ben Yochai was the preeminently anti-Gentile teacher. He is infamously quoted as declaring (Yer. Ḳid. 66c; Massek. Soferim xv. 10, etc), "The best among the Gentiles deserves to be killed." Judah ben 'Illai recommended the daily recital of the benediction, "Blessed be Thou… who hast not made me a goy" (Men. 43b). The great sage Judah ha-Nasi, on the other hand, makes a distinction between those Gentiles that oppressed Israel to those that did not. In later diaspora Judaism, discrimination against Gentiles, while technically allowed, was nevertheless seldom practiced. The principal restraining factor was the fear of "profaning the Holy Name." Despite the stereotypes perpetuated by fictional characters such as Shakespeare's Shylock, it was considered necessary to overlook legal quibbles which might appear unjust in the eyes of the world, and which would reflect on the good name and integrity of the Jewish nation and its religion. "For the sake of peace," the preservation of the friendly relations between Jew and Gentile was considered paramount (Ab. Zarah 26a; B. Ḳ. 113b). On the other hand, it would naturally be quite unsafe to trust a Gentile as a witness, either in a criminal case or in a civil suit. He could not be depended upon to keep his promise or word of honor (Bek. 13b). Nevertheless, documents and deeds prepared by Gentile notary courts were to be admitted as valid evidence (Giṭ. i. 4). Rabbi Simeon himself even validated a Jewish writ of divorce signed by a Gentile notary (ibid). A Gentile's testimony to a man's death was sometimes held sufficient to release a woman from her marriage bond and to permit her to marry again (Giṭ. 28b). Despite such injunctions, the conversion of the Gentile world to Christianity and Islam made the status of Gentiles as "heathens" obsolete. For example, the early prohibitions against a Jewish physician offering his services to a Gentile patient was contrary to the practice of the Jews in the Middle Ages. Maimonides himself became the physician of Sultan Saladin in Egypt. Likewise, the prohibition against the employment of a Gentile nurse or midwife was modified by an eminent authority by adding "so long as there is a Jew living in that town who is liable to come into the house" (Moses of Coucy, "Semag," § 45). The anti-Gentile laws were not expunged from the rabbinic literature after the advent of Christianity mainly because of the persecutions and the barbaric treatment of the Jews in various times and places during the Middle Ages. A gradual decrease of rabbinic animosity toward Gentiles may be seen by comparing the halakic codes and collections of responsa, where rabbinical animosity toward Gentiles reoccurs mainly in times of persecution and diminishes in times of peace. For Orthodox Jews today, the main distinction between Jews and Gentiles today is that Gentiles are required to keep only the Noahide Laws, those rules supposedly given by God to Noah and his descendants, while Jews are required to keep the entire corpus of the 613 Mosaic Laws. Reform and secular Jews make even fewer distinctions, often blending in completely with Gentile culture. Do not go among the Gentiles or enter any town of the Samaritans (Matthew 10:5). On my account you will be brought before governors and kings as witnesses to them and to the Gentiles (Matthew 10:18). You know that the rulers of the Gentiles lord it over them, and their high officials exercise authority over them (Matthew 20:25). Jerusalem will be trampled on by the Gentiles until the times of the Gentiles are completed (Luke 21:24). Saint Paul was chosen as the apostle to the Gentiles (Acts 9:15). However, Paul is reported to have begun his ministry in various cities by preaching first to Jews and only later to Gentiles (Acts 13:46). The issue of Jewish-Gentile relations soon became a major bone of contention between Paul and the leaders of the Jerusalem church, with the leaders of the Jerusalem Church decided that Gentiles could join without becoming Jews, so long as they followed the Noahide commandments (Acts 11). Only after the destruction of the Temple of Jerusalem in 70 C.E. and the consequent scattering of the formerly central Jerusalem church did Christianity emerge as a religion primarily for Gentiles, but with Jewish roots. The New Testament literature itself may be seen as directed both toward Jewish and Gentile audiences. The Gospel of Luke and its companion the Book of Acts, for example, are usually considered to have been written by a Gentile author for a Gentile Christian audience. The Gospel of Matthew, on the other hand, appears to have been written by a Jewish Christian with Jewish Christian audiences in mind. One of many evidences for this is the fact that in Luke 3, Jesus' lineage is traced to Adam rather than to David as in Matthew 1, thus emphasizing Christ as the Messiah of the entire human race rather than only the nation of Israel. Likewise, Saint Paul often directs his letters to the predominantly Gentile Churches, while the Epistle to the Hebrews, no longer seen by most scholars as Pauline, seems to be written to Jewish Christians in an attempt to convince them of the superiority of the Christian New Testament covenant over the "old" Jewish covenant with God. Several of the Church Fathers referred to non-Christians as Gentiles, and this tradition continued into the Middle Ages, when Saint Thomas Aquinas wrote his Summa Contra Gentiles. Throughout much of Christian history the term was used synonymously with "infidel" in referring to heathen non-believers, sometimes erroneously including Muslims in this category. As recently as the early twentieth century, the Catholic Encyclopedia stated, "The word Gentiles designates, in theological parlance, those who are neither Jews nor Christians." Numerous Protestant writers also used the term Gentile to refer to non-believers. In the terminology of The Church of Jesus Christ of Latter-day Saints "Gentile" often refers to non-members of the LDS Church. In such usage, other Christians and even Jews may be colloquially referred to as Gentiles. 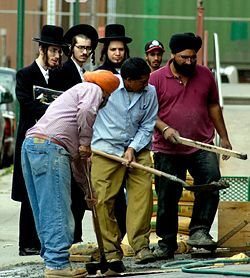 The Amish, likewise, refer to those not of their particular faith as Gentiles. Braaten, Carl E., and Robert W. Jenson (ed.). Jews, Gentiles and the People of God. Wm. P. Erdmans Publ. Co., 2003. ISBN 978-0802805072. Donaldson, Terence L. Judaism and the Gentiles: Jewish Patterns of Universalism (to 135 C.E.). Waco, TX: Baylor University Press, 2007. ISBN 978-1602580251. Himmelfarb, Milton, and Gertrude Himmelfarb. Jews and Gentiles. New York, NY: Encounter Books, 2007. ISBN 978-1594031540. Porton, Gary G. Goyim: Gentiles and Israelites in Mishnah-Tosefta. Atlanta, GA: Scholars Press, 1988. ISBN 978-1555402785. Watson, Francis. Paul, Judaism, and the Gentiles: A Sociological Approach. Cambridge: Cambridge University Press, 1989. ISBN 978-0521388078. This page was last modified on 26 May 2017, at 16:32.